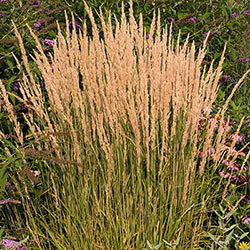 This grass produces magnificent feather plumes of wheat-colored seed heads that bloom in late spring and then decorate the landscape through winter. 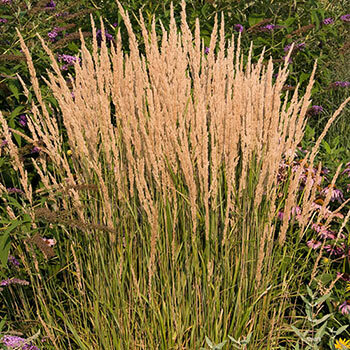 Its attractive, vertical clumping habit makes it ideal for use as a screen, accent plant or backdrop for other perennials. It's easy to see why it received the Perennial Plant of the Year award! Bloom Time Late spring, and plumes remain through summer and into winter. Foliage Type: Narrow green leaves, with a vertical clumping habit. Flower Form: Narrow, erect, golden wheat-colored plumes. Soil Requirements: Well-drained, organically-rich, moisture-retentive soil. Does well in heavy clay soil. 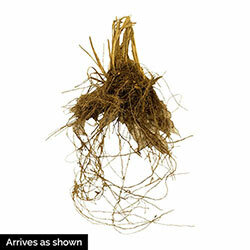 Pruning: Prune back to 6-8" (15-20 cm) in early spring, before new growth appears. Early spring.